Rhyne Williams started very well. He was consistent, and gave Rubén Ramírez Hidalgo nothing to work with. Williams was up a break after Rubén Ramírez Hidalgo double faulted at 1-1. The Spaniard was all over the place, and seemed frustrated by Rhyne’s defense. But soon after, the errors started to flow from the American’s racquet, and the set was back on serve at 3-all. 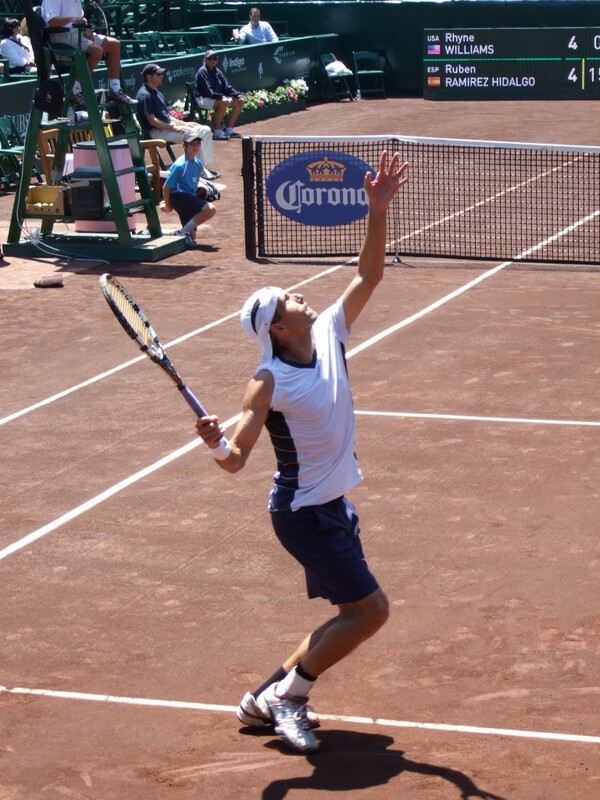 Rubén Ramírez Hidalgo was having quite a bit of success by attacking Williams’ forehand. Rhyne’s forehand defense seems like a work in progress at the moment. Near the end of the set, I looked up some info on Ramírez Hidalgo. For some reason, I hadn’t done it until now. I then realized that the Spaniard is 35 years old, hasn’t won an ATP match in 2013 (he’s 0-5), and if you dig deeper, the man hadn’t won a tour match since the 2012 US Open. His wins this week against Somdev Devvarman and Fernando Verdasco must’ve felt huge for him. Now I regret not requesting Ramírez Hidalgo for a presser after his Verdasco win. The end of the set was extremely nervy for both gentlemen. 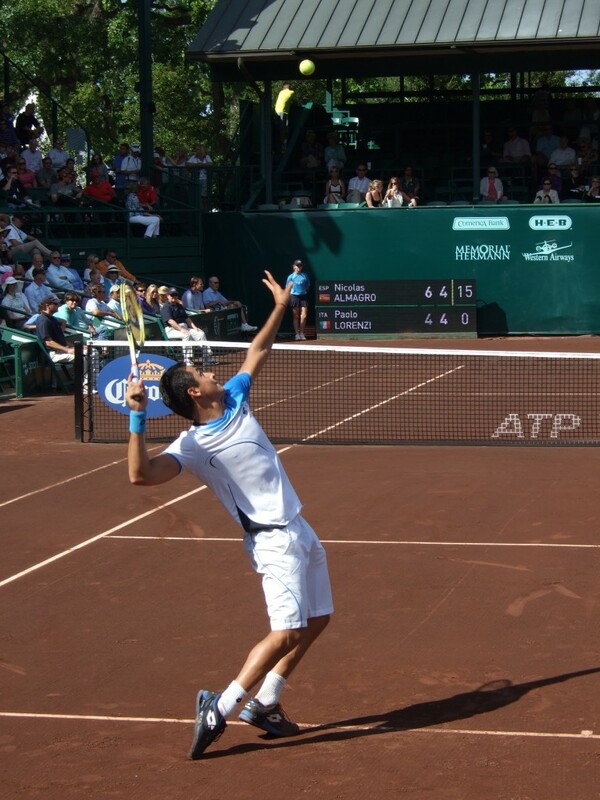 The young guy from Tennessee missed a sitter forehand at 30-all, 5-6 that gave Ramírez Hidalgo a set point. The veteran missed a forehand, Williams held, and the 35-year-old proceeded to play a horrific tiebreak, which he lost 7-1. I then left the court and came to the press room to type this up, and in the time it’s taken me to get this together, Ramírez Hidalgo has righted the ship rather dramatically: he just forced a third set by handing Williams a breadstick. Hence, it’s back to the Stadium Court for me! That was a fascinating end to the match. I got on court when Rhyne Williams was down a break, but had a chance to break back at 0-2. In that moment, as it had happened throughout the match, Ramírez Hidalgo found a way to attack Williams’ forehand successfully, and held for a 3-0 lead. The match seemed done and dusted, particularly because Rhyne seemed to be struggling with his left leg: he hobbled his way back to his seat during the changeover. However, Ramírez Hidalgo started to feel the pressure at that specific juncture, as well as the toll the sun was taking on him. Notice Ramírez Hidalgo’s black socks. Soon enough, Williams held rather easily to get on the board in the final set. One thing I noticed was that Hidalgo was having trouble finding Williams’ backhand, which was key in his strategy to create space on the deuce court to attack Rhyne’s forehand. The American was getting the ball near the middle of the court, and his forehand worked perfectly fine when it wasn’t having to defend and had time to pick its spots on offense. Coupled with that, Ramírez Hidalgo started donating his fair share of points: the Spaniard gave the break back at 3-1 with some erratic play. The match seemed wide open at that juncture. You had a 22-year-old who was struggling physically, and a 35-year-old who was having all sorts of issues with his game and his strategy. Rhyne Williams held for a 4-3 edge, and in the next game, Ramírez Hidalgo completed a collapse similar to the one in the first set tiebreaker: the veteran Spaniard double faulted twice in a row to hand over the deciding break to Rhyne. And just when everyone expected a nervy end to the match (it had been a rollercoaster so far), we got a rather unexpected flash of excellence: Rhyne Williams hit four incredible serves in a row to serve out the match at love. None bigger than the ace up the T on his third match point. The young guy will be in the press room in about 15 minutes, so tune in after that to hear some of what he tells us. – He’s exhausted, understandably. He’s hoping his body holds up for tomorrow. Today the back of his left leg was acting up on him (his left glute and quad were making it difficult to land after the serve). – Rhyne was happy that his serve, which he calls his best shot, came out in such spectacular way in that final game. He said that given his physical issues, he did not want to stay out there much longer. He went for big serves, and got all of the ones he wanted. – Williams said that he’s working hard on getting fitter, getting stronger, and getting lighter (he wants to lose five to eight pounds), given the physicality of the men’s tour these days. He mentioned Djokovic as the example of what’s needed out there. Maybe Rafael Nadal wants to give him a call, no? Rhyne is also thrilled with his success in the state of Texas (where he’s undefeated, since he won the Dallas Challenger). The 22-year-old will do his best to be physically ready for tomorrow’s semifinal. It looks like a pretty straightforward score, but it surely wasn’t: Almagro only had three break points in the entire match, and took them all. The number one seed created his first break chance of the match at the perfect moment in the first set: at 5-4 in his favor. He took it, which had to be a devastating blow for Lorenzi, who had a huge mountain to climb to begin with. The man from Murcia broke to start the second set, but at 4-2, he played one of his traditionally erratic service games, got broken, and Lorenzi got back into the match. From my vantage point, it still seemed that the match was an uphill battle for Lorenzi. The Italian just didn’t have enough weapons to punish Almagro, though he was serving well. But every time Almagro got a chance to attack, the fate of the point rested solely on his racquet (for better or for worse). In a case of tennis deja vu, Lorenzi found himself down break points at 4-5. This time they were match points, naturally. Almagro took the first one, outmaneuvering Lorenzi with his pace, and finishing off with a nice forehand winner to clinch his spot in the semifinals. – Almagro is happy about playing better than against Monfils, but he thinks he can improve some more. – Nicolás doesn’t know much about Rhyne Williams, but his coach watched some of the American’s earlier match against Rubén Ramírez Hidalgo. And as a bonus, Almagro is playing doubles with his 35-year-old compatriot. Nicolás and Rubén will be playing a doubles match later today, and while he said that they wouldn’t discuss Williams before the doubles match, he did hint that they would do so tonight. Nothing like having a good friend serve as your scout, no? 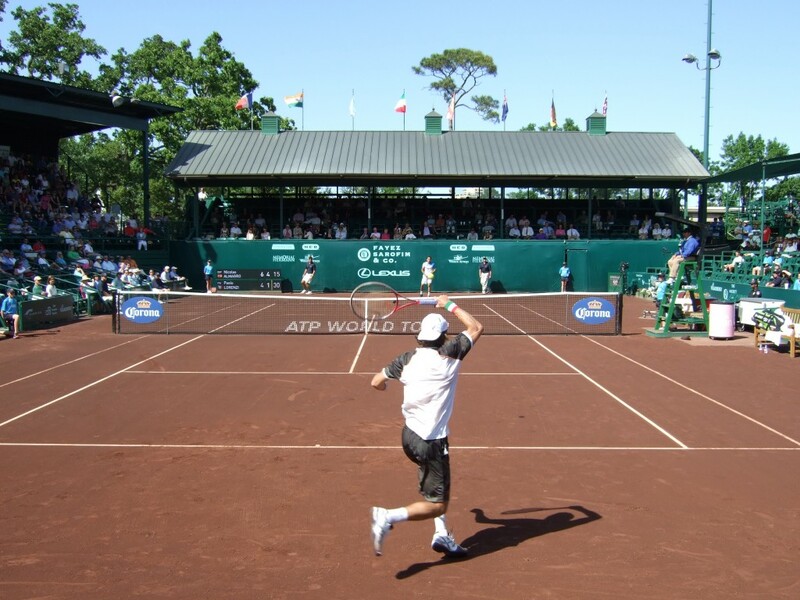 – This is a good time to note that Almagro is in the semis in both singles and doubles. Nicolás mentioned that he’s using doubles as practice for various things (serve, return, playing with more spin), and he’s happy to be doing well in that part of the event. – I asked him at the end if he uses video or statistics during the year, but you’ll have to wait a bit for that quote. It’ll be part of a piece I’ll write next week. Onward to lunch, and then settling in for some of the Bryan’s potentially historic win. The Bryans did win. Here’s the view of the moment after they clinched their historic win. There was no chest-bump, though. A very muted celebration. I’m guessing the twins are still reeling from the recent Davis Cup loss to Serbia. Three games decided this match. In all three, the server was very poor, and the returner had to do very little to get the coveted break. No break was obtained on a winning shot, either: Berankis lost his serve on a double fault in the first set, and Isner sent a regulation backhand well wide on break point in the second set. 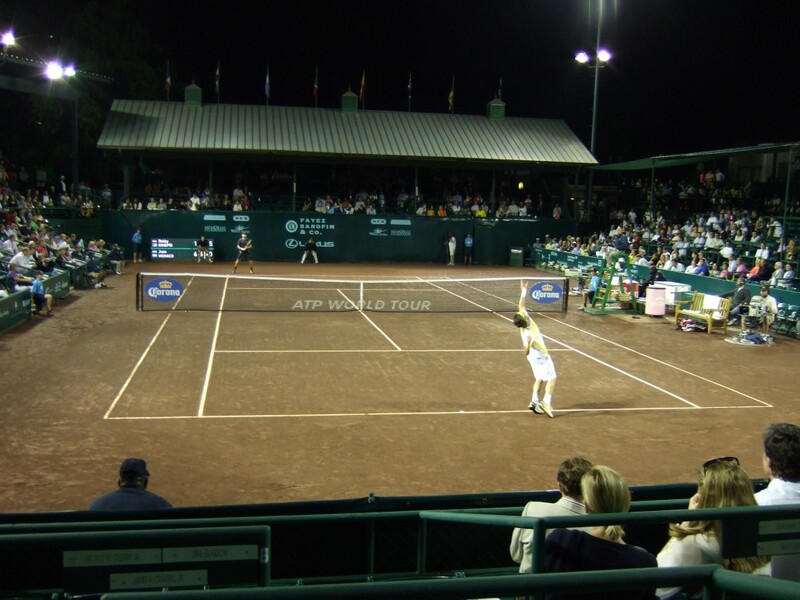 Berankis conceded the clinching break for Isner when he sent a short forehand into the net in the third stanza. These are the things that happen when you’re playing John Isner: the margins for error for both players are reduced to almost nothing. Berankis won all of five points on Isner’s first serve (ironically, he won three of those five points in the third set). The 22-year-old was trying to take the ball early on returns, but that was far from a successful strategy, as the numbers clearly state. 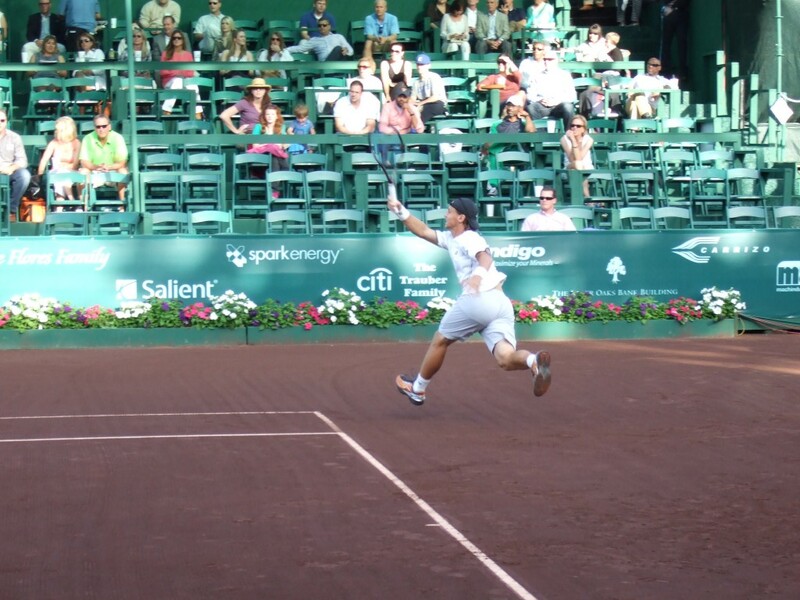 Whenever Berankis did get the return in play, the returns were short enough for Isner to punish right away. Ricardas was slightly more successful with Isner’s second serve: he won 11 of 23 points played on that delivery. All in all, it was a very good serving day for Isner, who really only had one bad service game in the entire match – that 4-3 game was the only time Berankis created break points against the tall American in the entire match. 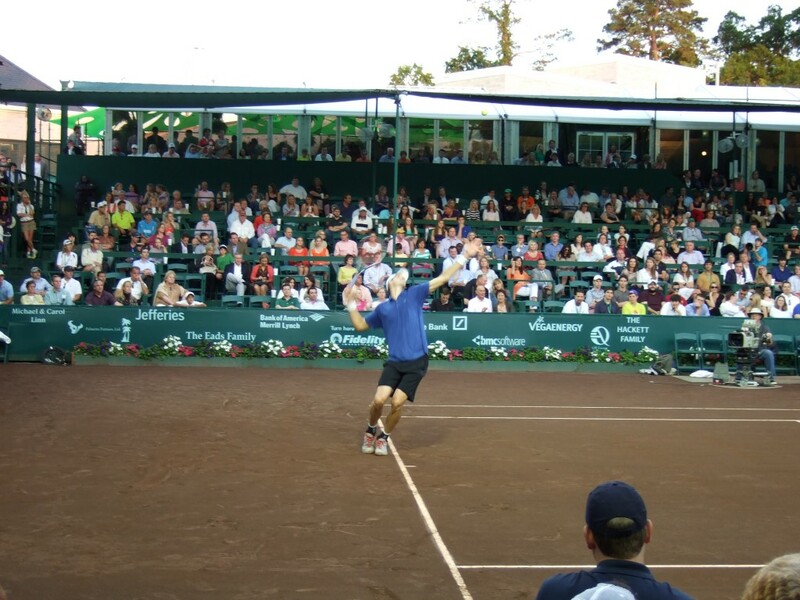 The Greensboro man served at 67% 1st serves, and recorded 19 aces, which is the 5th highest amount at this event since 1991. John also tallied 48 aces for the entire tournament, which ties his own mark from 2012 and 2009. It’s safe to say he’ll get a few more in the next round, and probably break the record: Isner is only 12 aces away from the 60 Pete Sampras hit during the 2002 edition of the Men’s Clay Court Championship (an interesting aside is that Sampras didn’t win the event that year: he lost the final in straight sets to Andy Roddick). 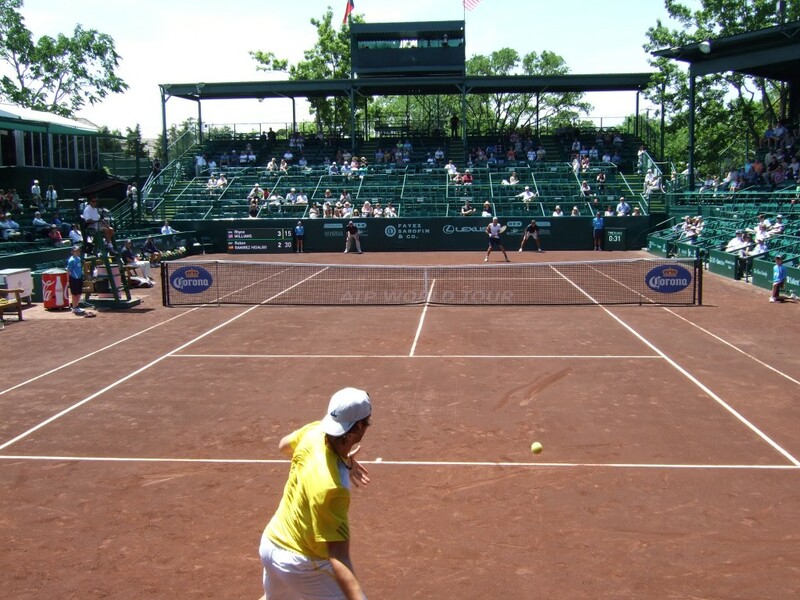 As for Berankis, he will surely be disappointed for those two loose games that ended up costing him the match. The Lithuanian had a good serving day himself: he only lost one more point on serve than John Isner. Berankis won 70% of his second serve points, which is an extremely high number for someone without a huge serve. 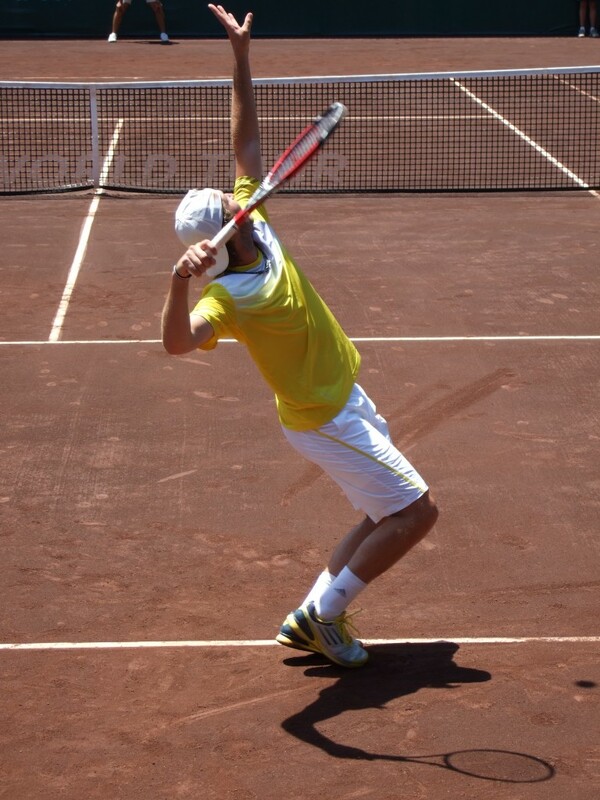 Still, Berankis should also be disappointed for not switching things up with his return. Perhaps he thought that if he moved back he would have had to hit the ball way too high. For someone who is generously listed at 5’9″, that is a justifiable excuse. – John said he’s been feeling pretty well (he came to press with an ice pack taped to his right knee, but he said it was just precautionary), pretty healthy. He feels like he’s turning a corner, kind of getting back to his level of the first trimester of 2012. 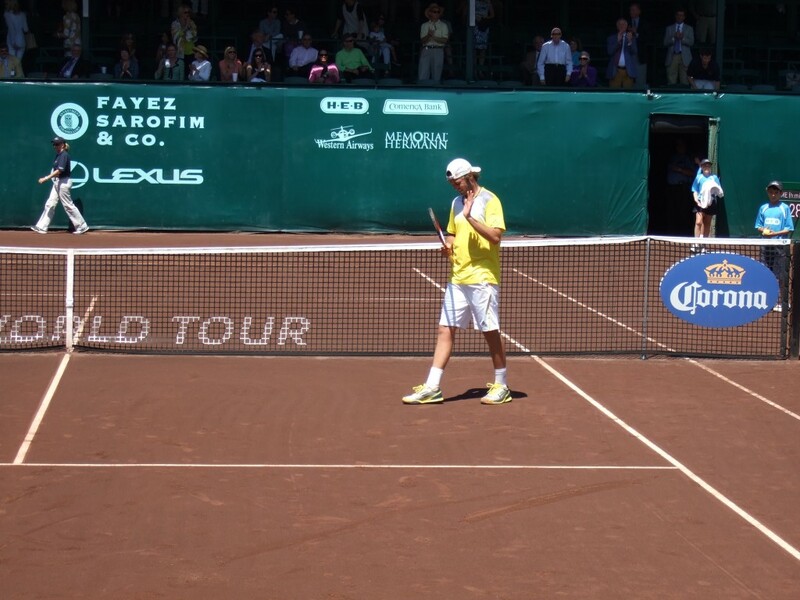 – Isner was full of compliments for his good friend Mónaco, to the surprise of no one. 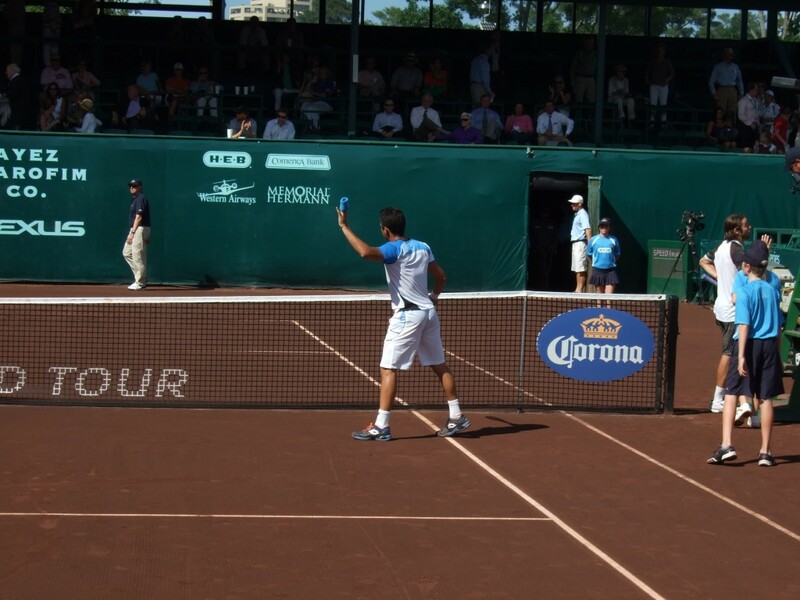 At the time of our interview, Juan was on his way to sealing the first set of his semi with Ginepri. – I asked John if he pays attention to where the returner sets up to take his serves. He said he doesn’t: at this point, he’s seen all sorts of looks (guys standing far back, guys standing close to the baseline). He says that doesn’t influence his placement at all: when he sets up, he picks a spot, and tries to hit it. Simple as that. I’m off to Stadium Court to catch some of Mónaco, who is flying high: already up a break in the second after delivering a breadstick to to Ginepri in the first. Juan Mónaco is back. He was flying high tonight, finishing a thorough demolition of Robby Ginepri in under an hour (56 minutes, to be exact). The bits that I was able to watch were simply sensational: Juan was once again playing at his highest level, which is remarkable, given that this man won his first ATP match of 2013 just yesterday. It’s interesting to think that Mónaco has conceded only two games in the last three sets of tennis he’s played. Once he found a way out of the first set breaker against Tim Smyczek yesterday, he’s been on an absolute roll. He said mentioned in yesterday’s presser that he felt much looser after that that tough first set, and surely that relaxed feeling carried over to tonight’s performance. The numbers say it all: Mónaco won 70% of the points played (54 out of 77). He never faced a break point. In fact, Juan won a higher percentage of first serve points than his good friend John Isner in the previous match: 92% for the man from Tandil to 90% for Isner. Both numbers are insane. And here are two more little nuggets: Mónaco’s serve hasn’t been broken yet, and he’s only faced one break point in four sets of tennis. – Juan was quite happy with his performance, as he should be. 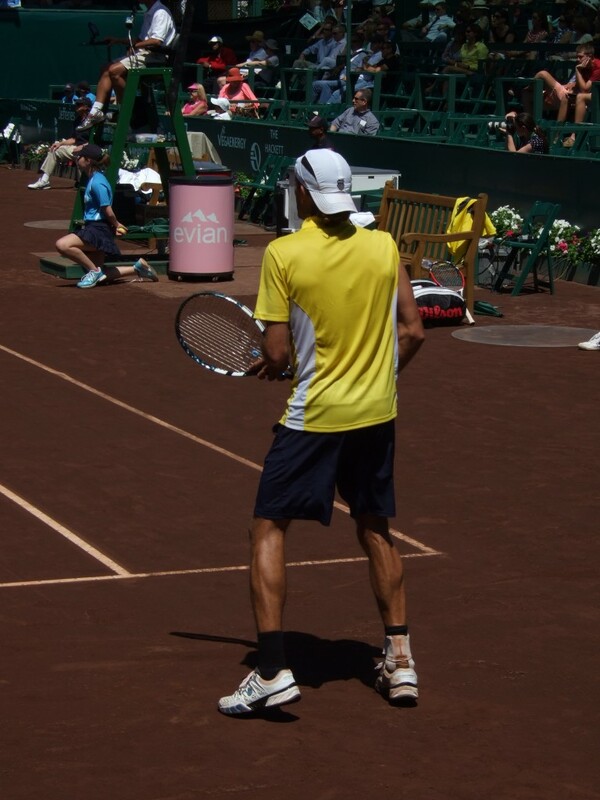 He likes the Stadium Court, and he said it helps to have good memories from years past in a court like that. – Mónaco is well aware of the challenges ahead: first, the bout with Isner will be a very difficult one, with few chances. And should he and Almagro make the final, that will be a tough battle. So there you have it: tomorrow’s semifinal slate will see the top seed face a young American who actually loves playing on clay, and the Men’s Clay Court Championship will see a rematch of last year’s final as well. Let’s not forget that the Bryan brothers will aim to win yet another match here in Houston: they absolutely dominate this event. Jamie Murray and John Peers will go for the monster upset tomorrow. 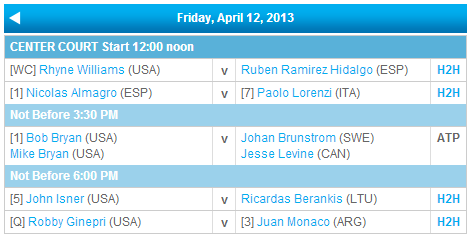 The format for the semis (and the doubles final) will be the same as today. ‘Til then! Juan José loves a well struck backhand down the line, statistics that tell a story, a nice lob winner, and competent returns of serve.